Some brief comments on the first day of conference. 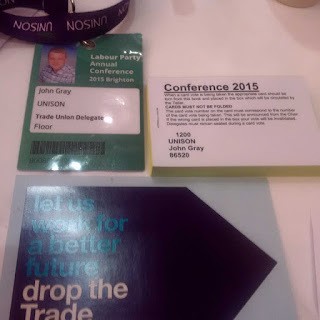 It started relatively early for me on a Sunday with a Unison delegation meeting at 9am. During which we agreed collectively our approach on motions, rule changes and internal elections. Conference started at 11am with a standing ovation for Jeremy Corbyn as he came on the platform and took his seat under the strap line "Straight talking". NEC Chair Jim Kennedy opened conference and the local MP Peter Kyle gave a welcome speech. Conference business started with a card vote on a call for a "Reference back" of the conference arrangements committee decision for ruling out of order some motions. Which takes me right back to past Unison conferences in this same hall. Next was a minutes silence for members who have died in the past year then Merit awards for long service to the Party including a 100 year old former trade union and Council leader. The General Secretary, Iain McNicol, gave his annual report followed by "best practice awards". I was pleased to see that Wes Streeting MP and the Ilford North CLP election team were given an award for their successful election campaign in May. Margaret Becket gave a report on the general election campaign "Learning the Lessons". We had actually generally gained votes in the election but generally in seats we had already strong majorities. Scotland was of course a disaster. We tended to do well in regions we were strong. There was 12 gains from Liberal Democrats and 10 from Tories but we lost 8 to the Tories and 40 to SNP. The one good thing about 2015 was that for the first time the long term decline in our vote since 1997 was reversed. Mary Turner from NEC gave a report on the National Policy Forum. Followed by debates and speech by Angela Eagle, Shadow Secretary of State for Business.